In the coming years we will have flying cars, homes that can be cleaned automatically and we are not going to school anymore with the weight of the diary ... oh no! The diary we can already throw from now, just download My School on our iPhone or iPod! 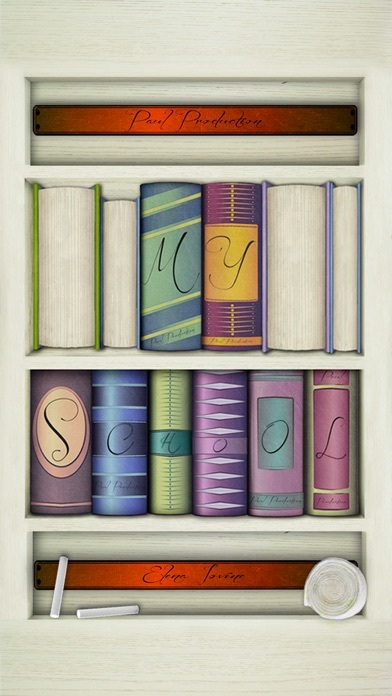 My School Agenda is an app that will accompany you from elementary to university, replacing the classic school diary. Complete calendar of where to store subjects, timetables and classrooms, also has two summaries one for the votes and one for homeworks. 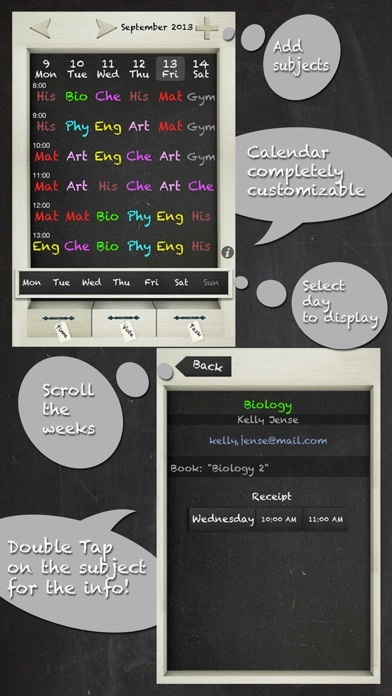 In the Time section you can customize your school calendar as you wish. All fields are optional (classroom, start time and end of the lesson) with the exception of the school subject. To fill the calendar you can tap the + at the top right of the screen or on the day of the week. Once the time has its subjects, with a double-tap on them, you can discover the informations of the subject (classroom, teacher, emails, notes, receptions). from right to left or from left to right, and return to the current day with to the button "today". The Vote section, has the first screen all subjects with the respective averages and at the bottom of them, the total average of all votes. 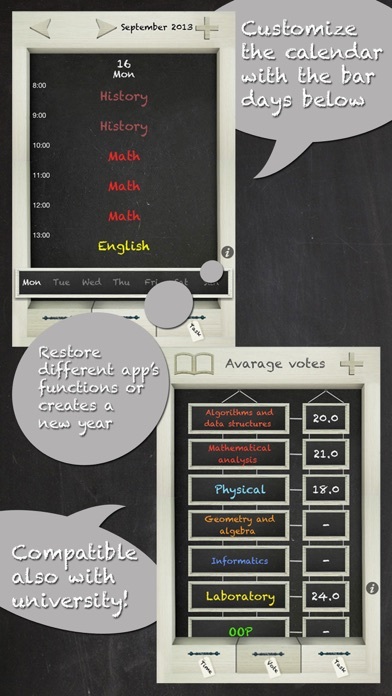 Is present a summary, viewable by tapping the book at the top left of the screen, where you will be summarized all the votes, month by month, with the option to delete them individually. To add a vote you have to touch the subject, in the screen of the averages, or + in the top right. To edit a vote, you have to double-tap on it, in Summary votes. 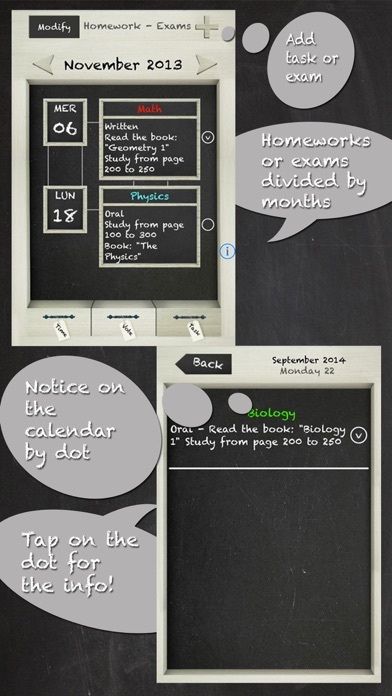 Task in the last section, you can add homework and exams with its subject, the kind of task or exam, notes and date. The date is connected with the first section Time, by a dot that will appear on the day indicated; tapping it will display a panel where you will be shown the information you have stored (oral or written or a warning, with note). To edit a task, you have to double-tap on it.